Everybody who wants to highlight the importance of the place they are writing about should find some records about the place. Prague Castle has at least two records. Firstly, it is the largest historic castle complex in the world and secondly, as part of the complex, St. Vitus Cathedral took a rather long time to construct. Its foundation stone was laid in 1344 and the Cathedral was finished in 1929. Its architecture is a combination of gothic and new gothic styles. The Castle architectural styles cover the development from Romanesque up to Functionalism. There is one spot behind the Cathedral where you can see all the styles starting by Sv. Jiří Church (St. George) as Romanesque continuing to gothic, renaissance, baroque, new gothic, etc. The Castle has typical castle’s segments – gates (there are three gates which are open till 10 p.m. every day), courts paved in marble, cobbled parts which form streets, the treasury which normally forms a part of a house or even a flat - is a separate building on one side here, the prison is on the other side, gardens, a castle moat, the riding hall, which offers a nice place for various exhibitions now, houses of the castle guard, known at present under the name of Golden Street. 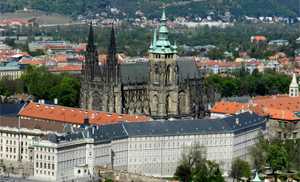 The Cathedral is a place where the Czech crown jewels are deposited. Seven of the most important persons of the country have one key each to this “treasury” and therefore all must be present to enable the opening of its doors. The Castle has also its legends. One of them says that it was just before the death of Charles IV, the most important king in Czech history, when the death-bell from the Cathedral started to ring and all the bells in the country followed it. Charles heard them and said: “My children, God is waiting for me and He will be with you forever”. There is another legend about a famous prisoner – Dalibor, a Czech rebel knight. Dalibor was interned so long in the Castle’s prison that he learnt how to play the violin. One of operas of Bedřich Smetana, a famous Czech composer, was based on Dalibor’s story and the Prague Castle prison bears his name, Daliborka. People use the saying: the need taught Dalibor to play the violin for situations when an unpleasant event/state forces you to master new knowledge. The Castle is an urban unit as well. It is surrounded by walls, had its own water source, offices, shops, post office, gardens, restaurants, churches, museums, galleries, etc. Czech Kings had their seat there and Czech Presidents always had their house there. Prague Castle is a lovely place with various facets which you can enjoy in any weather all year round from 5 a.m. in summer and 6 a.m. in winter. You can use several places in the Castle for vistas of Prague with its brick red roofs and hundreds of towers. The Castle is built on a spur which was already inhabited 5 000 years ago. The Castle itself was founded in 880 A.D. The ISPRS Congress logo is formed by the Prague Castle silhouette and you will be able to see it from the Prague Congress Centre next year. A recent ballot under Ordinary members elected the Philippine Geosciences and Remote Sensing Society as new Ordinary member. 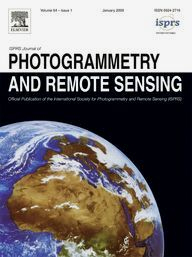 The Philippine Geosciences and Remote Sensing Society is a group of experts in the field of remote sensing whose objective is to promote and advance the application of the field in areas of education, industry, research, and public service for the Filipino people and the country. With more than 500 participants from more than 52 countries, the ISPRS Geospatial Week 2005, held in La Grande Motte near Montpellier, France between Sept. 28 and Oct. 3rd, 2015, was a great success. GSW Director Nicolas Paparoditis, Clément Mallet and their team put up a most interesting programme, organised in a total of 11 independent workshops running parallel throughout the week. Common key note presentations which gave an overview of topics as diverse as 3D city modeling, UAV photogrammetry, lidar forestry applications and computer graphics were followed by in depth discussion in smaller groups. A more elaborate report of GSW 2015 will be given in the next edition of the eBulletin. During the GSW 2015 the decision was taken to hold the next Geospatial Week in China, organised by Wuhan University. A strong Chinese delegation submitted a winning application to the panel and was successful with their bid. Wuhan University is the largest university in the field of photogrammetry, remote sensing and spatial science with approximately 4.000 undergraduate and graduate students. GSW 2017 will take place from Sept. 18 - 22, 2017, with Deren Li, Honorary Member of ISPRS, as director. He will be joined by a large team headed by Jianya Gong (currently president of Com. VI), Huayi Wu and Bisheng Yang. We look forward to an interesting and successful Geospatial Week and already now welcome all readers to join us in Wuhan in two years. Austrian Society for Surveying and Geoinformation elects new President and new board. On the 6th May 2015 the Austrian ordinary ISPRS member OVG elected a new board. Julius Ernst was elected new president and Franz Blauensteiner is the new Secretary General. The former president, Gert Steinkellner, in office since 2003, is now an Honorary President of OVG. The ISPRS Community wholeheartedly congratulates Julius Ernst to the new job. We are sure that the excellent relationship with OVG will continue in the future. At the same time we are grateful to Gert Steinkellner for the many years of dedicated service, both to OVG and to ISPRS. We wish him well for all activities he will embark on in the future. ii) combined block from terrestrial and UAV-based images. Both sets come with some ground control points and the task of participants is to run the image calibration/bundle block adjustment. ISPRS working group III/4 "3D scene analysis" is pleased to announce the release of two new datasets in the context of the ongoing benchmarking activities. Researchers are invited to download the data and participate in these new benchmarks. The SGAC is a non-governmental organisation which aims to represent students and young space professionals (broadly in the age range of 18-35) to the United Nations, space agencies, industry, and academia. Based on the overarching theme of ‘Seeking Space for Future Development’, the GIM International Summit is being organised with the role of geoprofessionals as ‘caretakers of the Earth’ in mind. See www.cospar-assembly.org for more details. The University of Twente will host the 6th GEOBIA conference, focusing on the theme of Solutions & Synergies. As such, the focus will be establishing greater transparency and working towards better transferability of developed OBIA solutions, so that they can be more easily used in solving environmental or planning problems. Combining the very best of SPAR Europe and ELMF to deliver one unique event, the Capturing Reality Forum focuses on the technologies of laser scanning, LiDAR and 3D data capture and modelling. Incorporating an innovative conference and an international exhibition to provide an inspiring platform for professionals to meet, learn and share ideas with industry’s best. The conference aims at creating a meeting point of researchers and practitioners that address new challenges in geo-spatial data sensing, observation, representation, processing, visualization, sharing and managing, in all aspects concerning both information communication and technologies (ICT), as well as management information systems and knowledge-based systems. 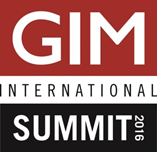 DGI is the only large-scale annual meeting in Europe of military and civilian geospatial intelligence agency leaders. The conference and exhibition provide a unique platform for 600 international GEOINT experts and attendees to exchange experiences, share plans and national programme updates, showcase the latest technologies and shape the future of the industry together. SkyTech 2016, organised in collaboration with SUAS Global, RUSTA & Flightpath Consulting, is a two-day tradeshow dedicated to advancing the commercial UAV industry across Europe. The geospatial event for everyone involved in the gathering, storing, processing and delivering of geospatial information. Incorporating an international trade exhibition, a cutting edge conference and a programme of live commercial workshops sessions, featuring the technology and services used by those working with spatial data. This biennial meeting intends to bring together the world experts, both from public and private sectors, to present and discuss the recent findings and developments on Sensor Calibration and Orientation. With the recent development of autonomous platforms, this traditional field of photogrammetry and geodesy integrates with robotics, computer vision and system control. The organizers are setting the conditions for a practical, informative and informal three-day meeting in a relaxed atmosphere, and expect to attract real experts with hands-on experience in the field. The presented full papers will be published in ISPRS archives. • Research and Teaching Methodologies for Master and PhD students. Gökgöz, Türkay, Baker, Moustafa Khalil M.
"Geodesy, Cartography, Geoinformatics and Cadastre. From idea to application"
ISPRS Joint Workshop on "Mobility and Land Cover Change Mapping"